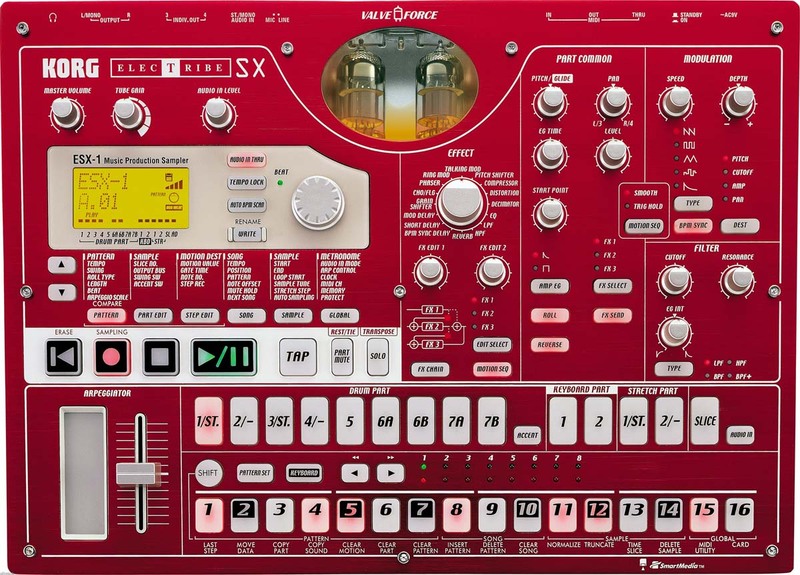 This week I found a great deal on a used red Korg ESX-1 Sampler. After watching a few videos on Youtube from “harlemnightsmusic” using the ESX-1 for creating those retro 80’s drum classics I became pretty intrigued by the possibilities of this retro red device. I also bought a Korg EMX-1 ( the blue one ) which has been fantastic with creating drum patterns and using to drive my Roland MKS-50. You can checkout the video below of “harlemnightsmusic” playing some beats along with Roland Juno 106 for some synth parts. The Korg EXS-1 I bought was the original “SmartMedia” version. To my knowledge there is no difference between the SmartMedia and the SD Card version of the Korg ESX-1. I picked up the Korg ESX-1 Smartmedia version for $150 which is substantially less than the SD card one. I already have a sizable collection of Smartmedia cards so I figured the ESX-1 SM version would work well. My blue Korg EMX-1 also uses Smartmedia cards. In Japan they are quite cheap on the used market. I run across them quite often. I also still have the original tubes in the ESX-1 and may elect to upgrade them but for now it’s a great sampler with a lot of possibilities. I personally feel the Korg EMX-1 and ESX-1 are great little gems and along with my analog gear will use them quite a bit. This is a great Youtube video of the Korg ESX-1 and Roland Juno 106 together in action. Great stuff! 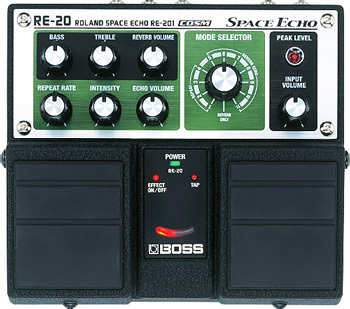 I recently picked up a used Boss RE-20 Space Echo for my analog synthesizers. I spent quite a bit of time researching this twin effect pedal and finally decided to give it a try. I actually quite like it so far when used with my Korg Poly-61, Roland Juno 106, and other synths. the reverb is very usable and the delay/echo is excellent. I particularly like how the effect trails when playing which is one of the main reasons I bought it. You can also change synth patches and the trails will continue and not get cutoff. I usually have my analog synths on an Ultimate Stand and I found that I could easily velcro the Boss RE-20 near the top of the stand propped up above my top synth. The knobs are tilted perfectly so I can tweak while playing any of the synths. I must say that the Boss RE-20 sounds really warm. I usually set the reverb in the low 25% range and up the bass a bit. You can also back off on the treble which can fatten things up a little bit. This pedal effect really enhances my analog synths tremendously and when bypassed I hardly notice that much tone loss. I know there is some, but I don’t really hear it that much. The reverb I suppose can be tinny with a lot used, BUT, this can work well depending on what patch you are using in your synth. I also like the tape nuances in the pedal and the echo really compliments nicely with sounds from my Korg and Roland synths. After reading mostly excellent reviews of the Boss RE-20, I felt it would work nicely with my analog synths adding some delay, reverb, and a bit of extra flavor that the Boss RE-20 provides. I also like the input volume and the distortion you get when cranked which is pretty cool on some gritty synth patches. I feel there is much more to learn about this pedal and I’m happy with the purchase. It’s definitely a lot of fun and like others have mentioned, it does sound nice with analog synthesizers for sure. Note that the Boss RE-20 is not an analog effect, rather I use it on analog synthesizers. The Boss RE-20 is all digital, but sounds very warm with my analog synths. It’s actually quite a popular twin pedal for analog synth enthusiasts and for the dub crowd which I recently discovered. I’m not particularly into Dub Music, but it’s pretty useful for that genre. The Boss RE-20 is also popular among guitar players of course and I’ve even heard vocalists us it for creating a unique sound for their voice. 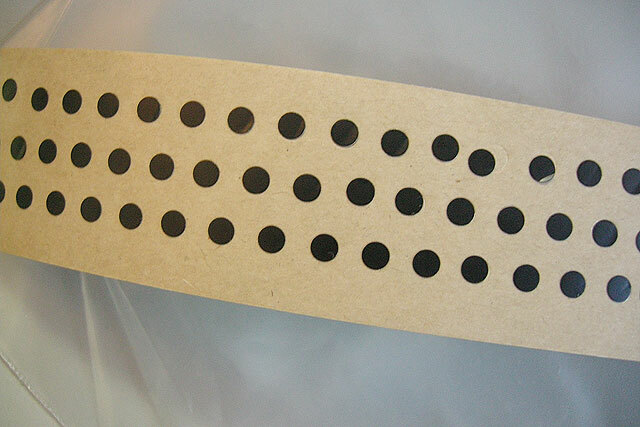 You can use this for Dub vocals too. On my newly acquired Roland Juno 106, I discovered I had a dead key (E) on the lowest octave. I researched and found out how to open, remove, and clean the carbon contacts ( upper and lower ) for the dead key. When put back into order I still had the dead key problem. So I then figured the carbon contact located on the Silicon rubber had to be wiped out. So I looked around on the Internet and found a gentleman who was selling just what I needed. They were “stick on” Carbon Contacts for Silicon Rubber with Dead Keys. They were not tested on a Juno 106, but for $25 bucks a sheet I decided to pick some up for a possible fix or future use. I attached two photos of what I received in the mail last week. I opened up the Roland Juno 106 and once again took out the dead lower E key. I gently placed a new Carbon Contact from the sheet onto the Rubber Silicon. You need to be careful when doing this as they do fly off the tweezers quite easily. It happened to me once, but luckily I found it. Then I closed up the Juno 106 and gave it a try. It didn’t work…laugh. Seriously it didn’t work at all. This means that the Carbon Contact either didn’t work ( unlikely, I’ll explain later ) or that I have now isolated the problem to the actual contact on the board below the keys. I now most likely will have to remove all of the keys, and trace the patch to the dead key to try and find a break in the connection. For now, I can live with the dead key as I don’t use it much and I can always midi up a controller with aftertouch and everything else that the Juno 106 doesn’t have. I did however as a test tried putting a Carbon Contact on a key that already worked and that worked fine. The Carbon Contact from the new sheet completely covered the old contact. I am assuming that if the Carbon Contact itself didn’t work, then it would block the original causing the key to become weak or even fail. Thus I am willing to bet that if and when an actual Silicon Rubber contact fails, these new replacement Contacts should work just fine. The Gentleman whom I purchased these from at http://sounddoctorin.com/synthtec/parts/key.htm is a great guy and very sincere. He was extremely helpful and his website has quite a bit of useful information on Synth repair. He also has replacement parts for sale. I highly recommend trying these new Carbon Contact Replacements for your dead keys provided you only have a problem with the Silicon Rubber part. If you have an issue on the board itself, then you’ll need to isolate the problem and perhaps do a bit of soldering to reconnect the dead key. I have read about this being done on the Roland Juno 106 and other synthesizers so it shouldn’t be too difficult. If you are actually missing Roland Juno 106 keys and need replacements for physical broken keys, I have seen many on Ebay. However, they are often sold one at a time, so it could be expensive if you need many keys. As always, you should weight the option of buying a second used Juno 106 for spare parts instead of selectively buying parts. Good Luck! Here is a quick shot of one of the new Analogue Renaissance Juno 106 Voice Chips I purchased from here: There is a photo of the chip already on that site, but it looks slightly different then the one I received. The main difference is the black socket like sleeve on the pins as pointed out in the photo. I trust that most people just leave it as is and install the chip to the board as shown. I thought it was worth mentioning though because to a novice, it certainly would raise a question or two. 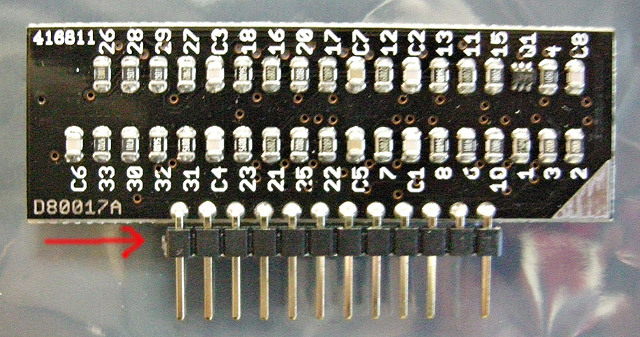 There also 11 pins instead of 12 for those counting pins, but the lack of black sleeve on the original chip shown on the site was interesting. Just to confirm, for those who have installed these chips, did you all in fact just leave that on there? Note it’s next to impossible to ask questions directly to Analogue Renaissance and there is no mention of product support. Although I hired a technician to solder a couple of chips, I am definitely a novice with only a few keyboard soldering projects under my belt. So I am posting my thoughts and findings on one of my blogs here for those who wish to comment. I’d appreciate hearing from anyone with either positive or constructive negative comments. After my experience thus far would I have purchased clone chips from Analogue Renaissance? Yes, but only ONE and not the package deal. If I can’t get one chip to work, then I certainly wouldn’t buy the rest understandably. Thus I made a mistake and am now trying to salvage and make it work with what I have. I most certainly would investigate rejuvenating older chips after carefully desoldering them. Perhaps if you buy new ones you can try the process found on Youtube. I posted a link in my previous entry below. If I can’t get the two installed to work, then I’ll most likely give away the remaining four and take the $400 loss. Ouch! I must reiterate that I have not heard ( or I should say found ) one single problem or complaint regarding the installation of the Analogue Renaissance Voice Chips. Based on that I would definitely grab and give it a shot. I only wish I knew why mine didn’t work. 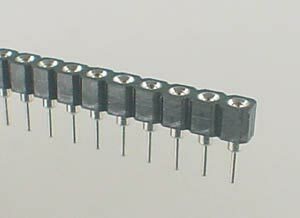 UPDATE – I believe these are called “Straight Male Headers – Single Row” which are a type of connector. You obviously leave the plastic part on there and just drop the chip into the slots. This is what I did so no problem there. 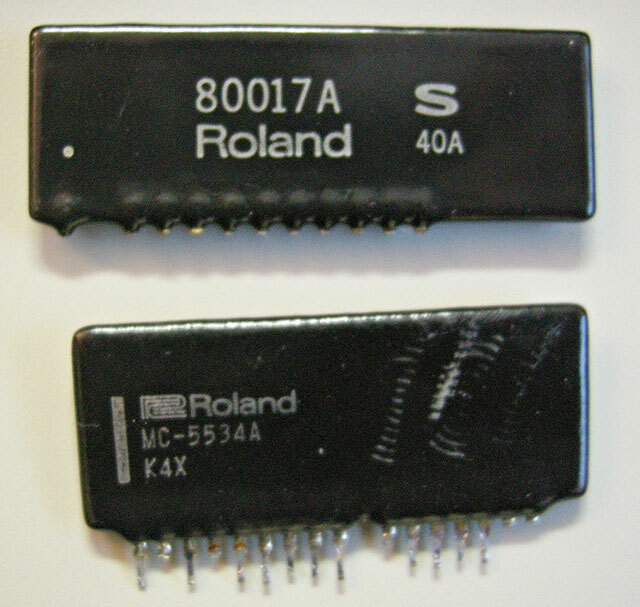 Here are two examples of Roland Juno 106 80017A and MC-5534A Chips Removed. The 80017A is the Roland Juno 106 Voice Chip. Note that the pins are broken from the removal process. I know there is a way to rejuvenate these old chips by removing the black resin cover, but I didn’t think I would need to do this given that I recently purchased brand new Analogue Renaissance Clone Chips. However, those do not work after installation into my Juno 106 board, so I kind of wish I had pursued that avenue first to save money or to at least test to see if an original would work. I recommend hopping over to Youtube and looking up the process before buying new chips like I did. 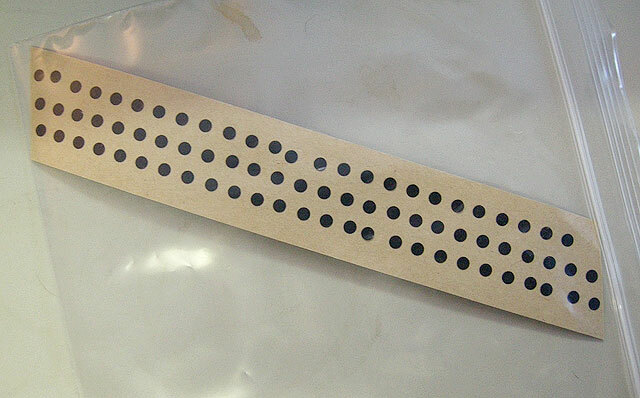 The Second chip pictured below is a removed MC-5534A Filter Chip from the Juno 106. This was removed because it was failing and I had received a new clone model from Analogue Renaissance, however, again there is no way at the moment to determine if it works because the Voice Chips around it from Analogue Renaissance don’t work. Board problem? Maybe so and I’m currently looking into it. Solder problem? Always possible, but I had a good soldering expert do the work, so it’s unlikely, but again possible. Just no solid answer on that yet. A couple of weeks ago I notice a lot of eight 80017A original Voice Chips were sold on Ebay from Belgium for a little over $500. They were apparently new and were from old stock. If you check on Ebay you can still find a few every now and then. I went with the Clones from Analogue Renaissance because after research I noticed 100% of the customers were satisfied and got them to work. Why my $400 package doesn’t work I don’t know, but it’s extremely disappointing to say the least.